Another solid SandForce SSD, but has that controller had its day? There's no doubt that 2011 was the year that SSDs hit the mainstream, and 2012 is certainly going to cement their place. There seems to be no end to the number of manufacturers producing new ranges of drives. The latest to hit the test bench is from Transcend, a company probably better known for its huge range of flash-based multimedia storage cards. The new SSD720 range of drives isn't the first time Transcend has dipped its toe into the murky waters of the SSD market. Back in the dim and distant past it launched a couple of drives under the Ultra name using the Indilinx Barefoot controller, but they were only available in 60GB and 120GB capacities and cost a hell of a lot of money. Thankfully, the SSD720 series is light years away from those drives in both performance and price per gigabyte, and are the first Transcend SSD to use a SATA 6Gbps interface. 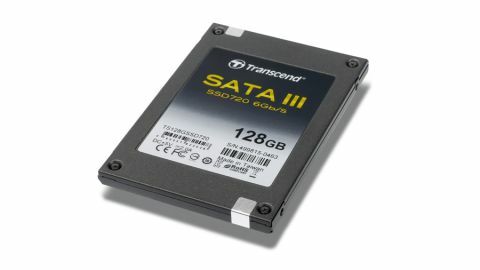 Transcend quotes sequential read performance of up to 550MB/s and a sequential write of up to 500MB/s for the 120GB SSD720. When tested with the ATTO benchmark though, our review drive produced slightly better figures than that: it hit a read score of 552MB/s and write score of 510MB/s. As is always the case when testing a SandForce-controlled drive using incompressible data (using the AS SSD benchmark) the controller doesn't particularly handle such files well, yielding up much-reduced scores - in this case 474MB/s reads and 157MB/s writes. But these are still strong figures for a SandForce drive. When you look at the Marvell-powered Corsair Performance Pro though, you can see just how well the Corsair copes with incompressible data - it's twice as fast on the writes as SandForce equivalents. In real-life terms that means it would take just 12 minutes to install a full copy of Windows 7 Ultimate from DVD, and cold boot in just 37 seconds. The Transcend drive's capacity is made up of eight 16GB SanDisk MLC NAND chips, which all sit on one side of the PCB, leaving the SandForce controller to fend for itself on the other side. The drives are available in 64GB, 128GB, 256GB and 512GB capacities, and have a 7mm format that makes them an ideal replacement drive for a notebook. The SSD720 doesn't come with any aids to help you install it. If the drive trays in your case aren't drilled to accept 2.5-inch drives, you'll have to put your hand in your pocket for a converter kit of some sort. Apart from producing one of the fastest SandForce drives we've ever tested, Transcend has also taken note of the price war going on in the mainstream 120/128GB marketplace and priced it accordingly. But while conventional wisdom always used to point towards SandForce-controlled SSDs, thanks to their weak incompressible data performance, the Marvell drives are making waves, which means Transcend's SDD720 isn't the only choice any more.